French company Flying Whales is developing a 500-foot cargo airship which will be able to lift an industry-leading 60 tonnes of lumber, outsize parts and machinery, a Bloomberg report said. The company has already secured about 200 million euros ($246 million) in capital. It plans an initial public offering in 2021, when a prototype is slated for its first flight. The Flying Whale will be twice as long as a Boeing 747 and have a rigid structure with individual pockets of helium, technically making it an airship rather than a blimp, which relies solely on internal gas pressure. It will be powered by small diesel or electric engines but require minimal power. According to Flying Whales founder and CEO Sebastien Bougon, investors include state fund Bpifrance, which injected €25 million this month, and AVIC, China’s main producer of military planes, transport aircraft and helicopters. France’s ONF national forestry office and the Nouvelle Aquitaine region in the southwest of the country are also backing the project. The company estimates likely sales at €5 billion over 10 years from a fleet of 150 machines built in factories in France and China. The Bloomberg report noted that the Flying Whales project is not the only airship being developed for the heavy-lift market. American defense contractor Lockheed Martin in 2016 signed a contract for the construction of 12 units of its LMH-1, which is primarily targeting the oil and gas industry. 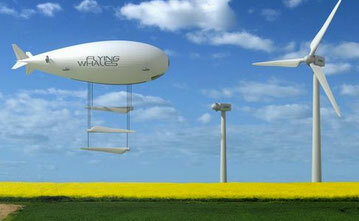 The model is a true blimp without a frame and is limited to carrying 20 tonnes of freight. The Flying Whale is also competing with the Airlander 10 constructed by UK-based Hybrid Air Vehicles, which is currently the world's largest aircraft. Dubbed the “flying bum” because of an elliptical profile that allows it to gain lift like a conventional plane, the model suffered setbacks in 2016, when it crashed-landed and again last year after breaking free of its mooring mast in windy conditions. Flying Whales' Bougon said that while the rigid design of the airship allows a bigger payload to be carried, or slung beneath the airship, the elimination of the need to land also makes it safer. He added that the craft could easily be transformed into a pilot-less drone, although current plans envisage keeping at least two people on board for security reasons.